The 2016 book bingo challenge continues! To fill the space of “A book with a one word title” I read Attachments by Rainbow Rowell. I’m not going to sugarcoat this one. 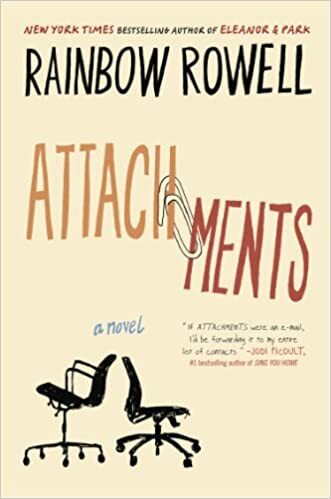 This book was…… ok. I’ve read a book by Rainbow Rowell before (Landline) and I will admit that while I did like Attachments a LOT more… I still didn’t love it. Am I glad that I read it? Sure. Will I wholeheartedly recommend that you go pick it up right this very second? Nah. I don’t think you’ll be mad that you spent your time reading it, but… meh. You could probably pick something better. There were quite a few things I liked about this book, but there were also a lot of things that I didn’t love. -Even though there didn’t seem to be too heavy of a plot, the book had a nice pace to it. I didn’t feel like the story was dragging at all. -It was genuinely fun to read! Once I figured out who all the characters were and what was going on, I really liked reading along with them. -This made me think about me and my friends I work with now (and ones I used to work with) and when we send IMs to each other. -This was an easy read. No actual thinking required. It would be a great book for an airplane or laying out by the pool. -The people seemed real. The relationships between people felt real. Their emotions were relatable. -It made me actually want to take steps to improve my life instead of just talking about what I should be doing. -There wasn’t much build-up and then the ‘resolution’ of the major plot point just kind of… happened… and it didn’t seem very believable to me. It just didn’t really seem like something that Beth would do. Even though she says “I never do this.” Still didn’t like it. -What was the point of Sam coming back? She showed up, and then just disappeared. There was not conflict there. No resolution even. She just wasn’t talked about again. She and Lincoln live in the same small town- I feel like they would see each other again. I feel like there was enough impact just hearing about Sam, I’m not really sure why she was put into the story as an actual character. -The scene in the movie theater. They were sitting near the front of the theater. There were other people in the theater. Are we actually supposed to believe that they just sat there and made out for like 2 hours without anyone complaining? Pretty sure most movie theaters would tell them to cool it. Just saying. -The fact that Lincoln just up and quit his job. I know that it had to happen in order to push forward the story, but it seemed like the easy option. Maybe there would have been more of an effect/more confrontation if he would have stayed at his job and had to deal with it there? Who knows. I love this book bingo challenge!! So cute!! !